Tags: Laundry, Liquid and Powder. Our EnviroKlenz laundry enhancer acts as a boost to your normal favorite detergent. Our, patented earth mineral technology attaches to chemical and malodors and neutralizes them on contact. Normal detergent work by masking or slightly reducing the odors but are limited to or kinds of odors that it can remove. Chemical odors mesh themselves deep into fabrics and are sometimes almost impossible to get out using traditional methods and home remedies but that is where the EnviroKlenz technology strives to completely remove and neutralize stubborn odors that normal detergent leave behind. Maybe your teenage son left his sweaty soccer uniform sitting under a wet towel in his bedroom for a week. Maybe you’ve brought your summer clothes out of storage, only to realize they smell exactly like the plastic box you’ve been storing them in all winter. Or your best friend borrowed your favorite dress, but now it reeks of her perfume. Or you’ve just bought some new curtains, but they’ve got this awful chemical smell that makes you sneeze and that just won’t wash out. No matter what the situation is, this small but mighty laundry powder is the “magic ingredient” that makes it all okay. It’s safe to use in any type of washing machine and on most types of fabric. Safe on: Cotton, delicates, nylon, polyester, spandex, washable lace, washable rayon, washable wool, and any other fabrics the manufacturer deems safe to put through a wash cycle. SKU: N/A. Categories: Laundry, Liquid and Powder. 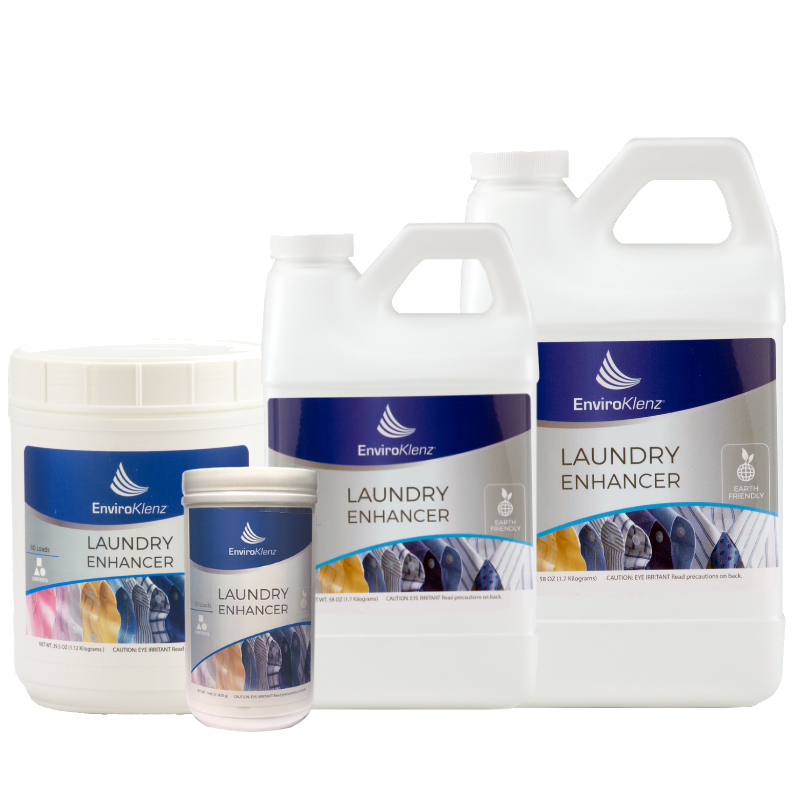 EnviroKlenz Laundry is a safe and effective laundry enhancer that removes stubborn laundry odors such as musty & mildew smells, fragrances from detergents & fabric softeners, perfumes smell and scents, thrift store odors left on clothing by the previous owner. EnviroKlenz Laundry Enhancer works along with your normal detergent to enhance its ability to remove those tough odors that would normally be impossible to remove and best of all EnviroKlenz laundry Enhancer contains no masking agents or fragrances providing you with clean and odor results. Safe clothing can be a huge problem for those with MCS/ES, allergies, or environmental illnesses as they contain many harmful chemical odors such as formaldehyde, polyaromatic hydrocarbons, and arylamines which cause health and/or environmental problems. New clothing or clothing purchased second hand from a thrift store may be washed with EnviroKlenz Laundry Enhancer to safely remove chemical odors from the clothing and make them safe for the chemically sensitive to wear. The EnviroKlenz Laundry Enhancer comes in two different versions, a liquid and powder version. Please read all the product label instructions and follow those directions as best as possible. The instructions below are a step by step guide for using both the liquid and powder EnviroKlenz Laundry Enhancers. Add 1/4 cup (small load) or 1/2 cup (medium or larger load) of the Laundry Enhancer along with your regular (unscented) detergent to eliminate odors from your laundry. For HE and front load washers, add the enhancer along with your detergent in the designated detergent slot. For top load washers, first partially fill the tub with water. Next add your normal detergent, followed by the enhancer. For the best results use warm water and do not use in combination with bleach or vinegar. Add 1 scoop (small load) or 2 scoops (medium or larger load) of the Powder Enhancer, along with your regular (unscented) detergent to eliminate odors from your laundry. For top load washers, first partially fill the tub with water. Next add your normal detergent, followed by the Powder Enhancer, agitate the powder in a tub with water and then you can add the clothing. The EnviroKlenz Laundry Enhancer is safe for use on cotton, personal delicate, nylon, polyester, spandex, washable lace, washable rayon, washable wool, and all other washable fabrics. Not intended for use with bleach or on dry-clean-only fabrics, leather, satin, silk, and suede. This product is safe for the environment, made from proprietary materials. Safe to use in High-Efficiency washing machines. Here are some suggestions and settings to use that encourage contact between our product and the offending odor/chemical source during the wash.
✘ Any prewash or presoaks cycles. Please do not use prewash or presoak cycles. If your machine has these types of cycles and you added our product to the wash basin, it will likely be removed from the wash before it has anytime to interact with the odor source. ✘ If the laundry additive folded inside of fabrics. Please do not have the additive in a situation where it does not freely move within the wash. Since our product does not behave like laundry detergent, it needs to be able to freely move within the Overloading into contact with the offending source odor. ✘ Overloaded wash cycles. Overloading the washing machine makes it difficult for the product to work properly. The level of contamination may be too much for the recommended dosage and the product may not be able to fully contact all the odor sources in the wash.
✘ Do not use in combination with bleach, vinegar or other additives. What is the difference between the powder and liquid version of the laundry additives? Both versions use the same technology and are optimized differently solely based on user preference. For front load washer we recommend going with the liquid versions and for top load, either the liquid or powder versions will provide optimal results. Does this product have any perfumes or masking agents? No. Our products are totally free of any added fragrance: via perfume, chemical compounds, or otherwise. 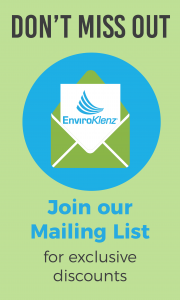 What is the difference between EnviroKlenz and OdorKlenz? Our line of OdorKlenz products (which was released before EnviroKlenz) are specifically designed to clear out odor issues that everyone deals with from time to time. It’s much more of a mainstream product for pet odors, malodors, and sports odors. What are the ingredients in EnviroKlenz? We only use three active ingredients: MgO (magnesium oxide), ZnO (zinc oxide), and TiO2 (titanium dioxide) powders. Can I use the laundry additive with vinegar? What if EnviroKlenz doesn’t work for me? Will EnviroKlenz laundry enhancer remove perfumes from thrift store clothes? 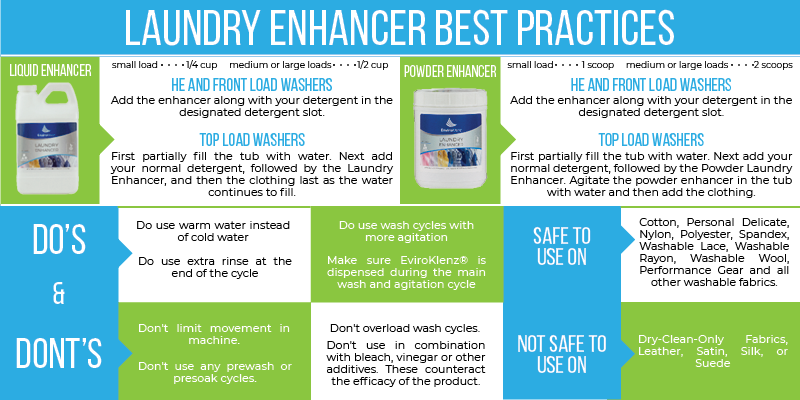 Do I need to use a detergent with EnviroKlenz laundry enhancer? Is your laundry booster strong enough to get the horrid smell out of thrift store clothes? Yes! We know clothes from the thrift store, while they’re cool & are environmentally-friendly purchases, sometimes smell terrible and there’s no telling how long ago they were washed or what they’ve been through since then. 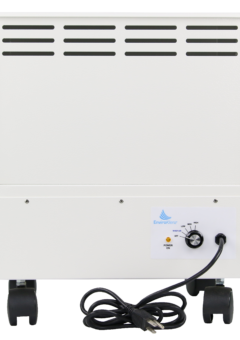 The main feature of our laundry booster is that it removes all unwanted fragrances… musty smells from old closets, tacky perfumes, or ingrained cigarette smoke. Can I replace my detergent with your laundry enhancer? We’d advise that you don’t. Our products are optimized to get rid of allergen and chemical-based smells and don’t include detergent-like ingredients that get out stains and dirt. For a truly clean, it’s better if you use your normal detergent alongside our laundry booster. I read about EnviroKlenz from a blogger I follow. She was saying how this has helped to get the “funk” smell out of her towels. I have tried many things from the scent boosters to white vinegar, even using bleach which then discolored my towels. The day I got EnviroKlenz, I washed a load of towels. By mistake they stayed in the washer overnight. As I took them out in the morning I was prepared to wash them again, but the “funk” smell was gone, even overnight in the washer towels. Even my husband asked what I had done differently. He now uses it with all our laundry, especially the grays, which seem to hold the “funk” smell too. So happy I found this product! Liquid version is easier to use. Great product for removing odors! I couldn’t believe how well this worked; I’ve used everything from baking soda, vinegar, salt, borax, etc. in different combinations and individually, and this did more in one washing than I had hoped for. When you buy 2nd hand clothes that have perfume/dryer sheet embedded in the fabric, it’s always taken many, many washings/soakings just to be able to wear them which is a waste of water/energy; very frustrating. This product has just flipped that; it only takes a maximum of two washings without all the extra work, and sometimes one washing and the clothes smell fresh. Thank you. This stuff has changed my life! I have life threatening reactions to chemical smells and EnviroKlenz removes all of them. It even removes the smells that embed in clothes from hair salons. Thank you so much for making this product! Excellent customer service on the help email. Same day and it was a Sunday. Have used the powder laundry enhancer for months & love it. It does a great job of getting rid of the odor! I am very sensitive to the chemicals and fragrances in new clothing, but I really like to shop at stores that sell fashionable clothing and not be limited to only places that sell eco- clothing. Unfortunately all of the major retailers I like to buy from (Aritzia, J. Crew, Anthropologie, Nordstrom, etc.) sell clothing that I can no longer bear without some sort of treatment to neutralize and remove the scents and chemicals. I found this product on a blog for people with sensitivities and have used about 1/2 a bottle now. I’ve learned that the best method for me is to soak the clothing in water for 4-6 hours with this additive, then wash with multiple rinses. Sometimes I have to repeat a second time for the really noxious clothing. It works a lot better for me this way than to add it in with the laundry detergent. I used to primarily use Borax but it made some of the clothing splotchy by taking out the dye. This didn’t do that. Also, it works way better than Oxiclean for me – that helps some, but is not as effective (plus, you can’t use it on wool). Keep in mind if you soak the water will REEK the first time and you may want to employ a non-chemically sensitive member of your household to dump the water, or instead use a pre-soak function on your washer if you have one. I also want to say thank you to the Enviroklenz for making this product! It’s allowed me to retain the normalcy of shopping for fashion-forward clothing with this unfortunate condition. I used this with my regular detergent to try and get the pet smell out of our clothes. No matter what I had tried before, it still smelled faintly of dog. Now it doesn’t! A little goes a long way, so you don’t have to use much. It takes the smells right out. And there is no scent to it, but it still works amazingly well! I have multiple chemical sensitivities and get an autoimmune reaction to most artificial fragrances. This does a great job of getting out fragrances that my husband may have been around during the day, especially at work. It does not do a great job at getting out fragrances from clothes worn by people who deliberately wear fragrance products – my sister in law gave me a shirt and I couldn’t get the scent of her deodorant out. I also use this on new clothes (organic, I won’t buy conventional clothes because of the high levels of formaldehyde and other toxic chemicals) to get out any fragrances from storage, shipment, etc. I definitely notice a difference using this compared to just washing. It is more effective in getting scents out. I do set the washing machine to do an extra rinse, since it can leave some residue, and I have to wipe down the door after doing a load to get the powder off. Laundry Enhancer has been a life saver for me. I have Chemical Fragrance Sensitivities. I had clothes that had been worn where there were multiple people with fragranced laundry products in their clothes and in the environment that had leached on to my clothes and even my underwear and did not come out after 3 normal washings. Laundry enhancer got it out once. I also use it when I buy new clothes that have chemical smells to them..it cleans those smells out in one washing so that I can wear them and have them in my house. I am so thankful for this product! Love! Works great, my husband forgets to change over the laundry sometimes and they stink after a day or two and with this they smell fresh! Great for people who buy stuff from Goodwill. I think they wash their stuff in stinky detergent. Gotta get that out! This works great. My husband is a farmer and his work clothes smell. He adds a scoop of this with his detergent and it takes the smell away. We also use it on every load of towels and sheets. I often thought my sheets smelled funky after being on shelf but when I used this they smell fine week later. We are a family of allergy prone people and this does not affect anyone. Tip, do make sure it dissolves before adding clothes or it may show up on clothes. I love this product. I have severe chemical sensitivity with a particular emphasis on clothing sensitivity. When my usual routine doesn’t get out fragrance or some other smell–this usually does the trick. Yes, your products work! I bought a duvet cover and pillow sham set on an auction website and discovered, to my dismay, that the seller had used a scented dryer sheet which smelled something awful. I could smell the fragrance before I opened the package. Well, I washed that duvet at least 4 times, used vinegar, then baking soda, put it outside in the sunshine, and that terrible synthetic, chemical fragrance would simply NOT leave. The duvet set was totally unusable. Then, I thought to search the internet for solutions to remove odors and found you. Viola! After one washing with your liquid laundry enhancer, the duvet has no scent at all. Just clean, fresh smelling. I’m so happy. Also, we had smoke and ash damage on some outdoor patio pillows from the recent Fire in Ca. I used your powdered laundry enhancer and those pillow covers no longer smell of smoke. They just smell clean and fresh. Your products are amazing! Thank you so much! I bought this and it worked beautifully. I bought a duvet cover on eBay and it really stunk from fabric softeners or something similar. Nothing else I tried totally eliminated the odor (10+ launderings with a few using baking soda and/or vinegar), but your product did! I just wanted to let you know that the Enviroklenz worked. The Bounce Dryer sheet smell is 90-95 % gone. I used the Laundry Enhancer on 3 expensive, new sweatshirts that had a bad chemical smell that wouldn’t come out with ordinary detergents. Bottom line is your Laundry Enhancer took the odor out. Saved me a lot of money and time buying new sweatshirts. recently bought a used pair of pants online. I did not see in the listing that they were coming from a smoker’s home. I am very allergic to cigarette smoke. The moment I opened the package I almost threw them out in the trash – they smelled so bad! Instead I googled removing odors from clothing and saw the name of this product. I am now a believer. Just one scoop of this powder witth my unscented laundry detergent and the smoke odor completely gone. I will also be using this on my new clothing, to remove the new clothing chemical smell. For those of us with chemical sensitivities, this is a great product! Works well. Clothes feel a little stiff afterwards. Hi Alison, we’re so glad you found this product useful! The stiff feeling often comes after the first wash because the product removes any lingering fabric softeners. Subsequent washes in warm water will assure that all of the product is removed from the garment, leaving your clothes clean, fresh, and (most importantly) chemical free! was in search of “green” laundry products since one of my kids suffers so from eczema. This kid also happens to play softball so getting rid of odors was also a factor. I’ve only washed her softball clothes in this once and it seems to do the trick as far as odor. She hasn’t yet worn her uniform to be able to say whether or not it aggravates her eczema time will tell. This is a laundry enhancer. It is added to your laundry to help remove odors and mold and mildew if needed. It is unscented. I added this powder to a load of towels that I use for cat accidents in my house. I could not believe the difference. It took all the urine smell out. It does not leave a fragrance. It just removes the odor you are trying to get out. This is a super product. Most enhancers leave behind their own smell. This one just does not do that. I love that fact. My order of EnviroKlenz Laundry odor remover just arrived and I tried it out right away. I have an active lifestyle as well as pets so I have my fair share of “smelly” laundry. Recently I have noticed that my clothes just do not smell clean even if I soak them prior to the wash cycle. I have changed detergents, used the “soak” setting, tried washing smaller loads, but nothing seemed to eliminate the lingering back odor of mildew or that shut up smell fabric gets if stored for long periods of time. I was ecstatic that EnviroKlenz worked like a charm. I followed the directions and bingo! No more lingering funk! I bought this to wash some things that I was giving to a very scent-sensitive friend. She recommended it to me. I will definitely use this in the future for my own things. It does just what it says – it takes out all the odors. Sometimes you wash stuff, and the body odors still remain. This is the answer to that problem. I discovered a huge pile of sheets and towels in my basement that really needed some deep cleaning. I use natural supplies for laundry and cleaning, they needed a boost. This product pulled all of the slightly musty smell out of everything. It has no smell. Yeah. I don’t know if I’ll use this product on my everyday laundry, but I am adding it to wash-clothes, towels, cleaning rags and super sweaty gym clothes. It is really doing a great job. My laundry enhancer powder from EnviroKlenz arrived early and well packaged. I purchased this laundry enhancer powder to deal with cat spray. I have to disclose that EnviroKlenz doesn’t advertise as a pet urine cleaner. However, I thought I would try it. My daughter’s cat sprayed a family quilt. I tried everything but bleach to get out the scent. I saw this and I thought I would give it a try. I used it twice now on the quilt and the yellow stain and scent are gone. The laundry enhancer also worked at getting the mildew scent out of a towel my daughter left in her bag for a week. The powder worked wonderfully at getting out the stain and scent of cat spray on my quilt. I’m really grateful. Nothing has worked so far. It worked really well. I can see using this product in the future. I have three cats so, this is a new definite laundry pantry must. The main reason I purchased this product is because is natural & safe for me and my family and the environment, also I was looking for a product that is able to remove odor from my bath towels, I have used many detergents, softeners and additional laundry products and enhancers to remove stubborn musty oddor, none of them work like this and What surprised me more about this product is that the active ingredients are only metal oxides, is safe and non-toxic, no chemicals and works with any washer the only small problem is that sometimes it doesn’t dissolved well even with warm water it needs to improve on that, but for the rest is fantastic and works great on my laundry. I have been putting this to the test in a couple ways. In the laundry: it says to use warm water,which I have been – but on a couple loads it still doesn’t dissolve well. Especially on the loads I have used the “express wash” setting. And I haven’t really noticed miracle results, just average and what I would expect. I have also used this to shampoo my carpets , when the carpets are drying we sometimes get a musty smell going on and I thought maybe it would help mask or eliminate it. I will say I like using it in the carpet shampooer better…. Again, it doesn’t dissolve very well even in very hot water. But it does help with the odor a bit. It might be earth friendly but $25 for 30 loads isn’t wallet friendly at all in my opinion. The container was pressure sealed and when i opened it, it basically exploded in my face and sent the powder flying everywhere….so watch out and open away from yourself. Overall, it is a decent product that does deliver said results but I cannot justify the price for the small amount you get. I have a pool and have found that even washing and drying the towels daily leaves them with a mildewy, not clean smell. This additive is wonderful! I just throw a heaping (included) scoop full into my front load washer and it helps whatever I’m washing smell truly clean. I should mention we use only free and clear detergent in my household, we all have extremely sensitive skin. This additive is recommended for use with fragrance free detergent and that’s perfect for this household. I will definitely purchase this item again for myself or a friend. I also want to mention, I emailed their customer service before ordering with some questions and they helped to immediately get it resolved. Very impressive! Works just like it is supposed to, it has been really hot here and my husband works outside and does he ever sweat. Last weekend my granddaughter told him that his tshirt smelled so I knew my detergent wasn’t getting the job done all the way, I washed his jeans and tshirts in this and they smell fresh again! My granddaughter will be happy to sit on his lap again!. I was surprised that after using the product my washing machine no longer had an annoying smell. I thought my towels were going to be neutralized and I received a bonus. I was shocked about the products effectiveness. I have a “cold water only” washing machine which leaves a lot to be desired when trying to remove smells. I used to wash twice and/or double the usual amount of detergent. Enviroklenz works! no more mildew/mold smells. I mix equal parts detergent and Enviroklenz and wash as usual. No added scent, just effectively removes bad odors. ordered this because my two year old daughter has a weak stomach and throws up regularly, the smell is hard to get out of her clothing. I ordered this hoping it would help. I’m pleasantly surprised it really did remove then soured smell form her clothes!! When I poured it into the washer I smelled the enhancer and it really doesn’t have much of a smell at all but I can’t complain because it works!! I did receive this item at a discount in exchange for an honest review. Overall I’d recommend this product if you need to remove some yucky smells! I’ve been testing this out for about a week on all my laundry. My husband works outside in the humid heat of Mississippi and starts sweating within 10 minutes of starting work. Can’t help but to in the Deep South. So needless to say by the end of the day his clothes are drenched and stink to high heaven. I’ve tried everything to get the smell out but nothing has seemed to work. Theres always a malodor. However I have noticed that this has really helped. It gets rid of the uric acid smell that always seems to come back out when you sweat again in old shirts. We live outside city limits and we use well water for all of our needs so sometimes that will contribute to stinky laundry. I mainly got this to add to my bath mats and towels as my kids have the bad habit of using towels once then leaving them in a ball on the floor so they acquire a nice musky stinky smell. The directions say to add 1/3 of a cup of this additive to small load and 1/2 cup to medium to large loads. I did a large so I added half a cup along with my laundry pod. This definitely helped neutralize the musky scent of the towels and bath mats. I was hoping that this will take the scent away completely but I am hoping that with continued use this will eventually take care of that old smell. Easy item to use and good results so far.I get the laundry enhancer and open it up and need to smell it. Weird, no odor. It would be the ultimate clean smell. No smell of chemicals. I read up on usage. You can simply add it along with you detergent. I do a load of my clothes. I must say that I am amazed. A product with no odor took the odor out of my clothes. The ultimate test would be with my wife. She gives it the smell test as likes it. No fragrance odor and no stinky odors…….just clean. We have a completed a few loads and we are sold on EnviroKlenz. Next, we will have to try the detergent. I am a Master Plumber of 28 years. I know dirty and I know stinky. We wash my clothes separate from others as my wife has heard the gross plumbing stories. We used to use a product called Odo Ban but my wife has a super sense of smell and the fragrance bothers her. I saw the listing for EnviroKlen laundry enhancer. It claims to take odors and even fragrances from your clothes. I order it up. I get the laundry enhancer and open it up and need to smell it. Weird, no odor. It would be the ultimate clean smell. No smell of chemicals. I read up on usage. You can simply add it along with you detergent. I do a load of my clothes. I must say that I am amazed. A product with no odor took the odor out of my clothes. The ultimate test would be with my wife. She gives it the smell test as likes it. No fragrance odor and no stinky odors…….just clean. We have a completed a few loads and we are sold on EnviroKlenz. Next, we will have to try the detergent. I got this to remove any sour or sweaty smells from clothing. We used it along with our regular detergent. We tried it on two loads. So far, it seems to do the trick. Of course, I can’t say for sure if the smells would have been removed without it or not. But they were gone. I will continue to use it when I have particularly smelly or hard to get out smells on laundry. Be sure to shake it up. It’s a white liquid. I do wish the lid also served as a measuring cup, but it is not a huge deal. Overall, it seems like a good product. Has no real smell of it’s own and it worked on what I have used it on so far. I will report back if that changes. Good Product, gets rid of smells without having to use other overpowering chemicals! Many times my wife uses other chemical products to get rid of overpowering laundry smells, this does the trick without! I got this product few days back …. really nice product …. this product removes all kinds of odor … works really great . I had several T-shirts that had developed an awful smell that would not go away no matter how many times I washed them. I simply could not wear them and was about ready to throw them out. Then I came across this EnviroKlenz liquid and decided it would be worth a shot. I added just over a cup of it in addition to my regular laundry detergent and fired it up on heavy cycle. After the cycle completed I smelled the shirts and so far so good, no odor. I threw them all into the dryer and fired it up. Once they were dry, I pulled them out and did the ol’ sniff test. Much to my surprise, the had no odor at all! Every shirt smelled nice and clean. I saved several of my shirts by using this stuff and I cannot say enough good about it. If you are dealing with any kind of odors on your clothes, this stuff is most definitely worth a shot, it worked for me. I am going to be honest here. I was skeptical about this product. A fragrance free laundry additive that was going to make my laundry smell BETTER??? It was able to get out really stubborn odors? OK, I gave it a try and my clothes came out fresh and clean. I decided to up the ante and wash our towels and sheets…again, fresh clean laundry. Then I brought out the big guns: my husband’s laundry. Yes, the filthy, smelly clothes which only a person who works in construction can generate. And guess what???? AGAIN, fresh clean clothes!!!!! I am a believer now…and you should be too!!!! You use 1/4 cup for small loads and 1/2 cup for medium to large. So, I have been using 1/2 cup each time and at this rate, it might not last a full 30 loads…but its still a large generous bottle which will produce a lot of clean clothes. I received this about a week ago and I have been doing all my laundry since then to give my true opinion, so first don’t expect your bottle to be filled all the way since you do have to shake it to activate it then add it with your detergent for it to work , obviously if it’s filled all the way you can’t shake it ok so I’m gonna be honest on my first load I didn’t smell any difference when I took it out the clothes from the drier but after having my girls use the clothes they noticed the great smell maybe I am sick or getting sick I couldn’t smell it good thing my daughters are very observant and notice everything ! Even my 3 year old noticed anywho I took my daughters to school and the teacher noticed I like that this bottle lasts me a long time and I don’t have to worry about the smell since my daughters play a lot they sweat so this took that odor right out I love this so far and if my opinion changes or the quality fades I will update this right away since I myself rely on these reviews too I take them extremely serious. I bought this to use in my front loader wash machine. It seems to get a smell on my clothes if they spend anytime after the wash cycle sitting in there. I have used this for a week and it has had good results. I do have a child that wets the bed, so part of my test was to see if I could get the urine smell out in just one wash using the Enviroklenz additive, the other part was to see if it would get the nasty mildew smell out of me front loader machine. 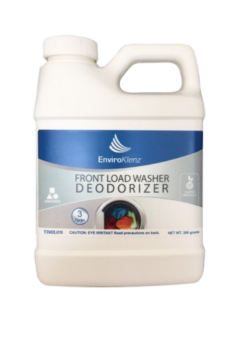 EnviroKlenz Laundry odor remover is advertised to remove stubborn laundry odors such as musty & mildew smells, fragrances from detergents & fabric softeners, perfumes smells, and scents , thrift store odors left on clothing by the previous owner. EnviroKlenz Laundry additive works along with your detergent to enhance its ability to eliminate those tough odors that would normally be impossible to remove and best of all EnviroKlenz laundry Enhancer contains no masking agents or fragrances providing you with clean and odorless results. So, up on the conclusion of my testing I did find that the urine odor was gone from the clothing when I used the product along with my usual Tide detergent. The tub of my frontloader also did not have a small. So I would have to say that it worked well for me. This is amazing stuff. In my personal experience anyways. I’m just glad we tried this product. For some reason, my skin has been all messed up lately. It could be due to so many factors, but first and foremost, I though it was due to the detergent we’re using. Then, I thought it was maybe the stuff I was slathering on my skin. Which is many. I also started taking probiotics, so I thought maybe I was having some sort of reaction. Anyways, I got these Hives and now my skin is rather sensitive. I also got a lot of insect bites this Summer and all the clothes I would wear started irritating my skin, especially around the collar. At first I thought this was a detergent, but it’s actually an additive. I had my husband use a tablespoon in an empty load first off to clean out our washer. We have an LG front loading HE washer and this was the first time we ever just did and empty load to clean it out. Then we did a load of whites with our usual laundry soap (Honest Co) and a tablespoon of the EnviroKlenz. We had no idea what to expect, but we were blown away with the results. Everything felt so much cleaner and softer and had NO scent whatsoever. I’m so impressed, I plan on buying some of their other products as well. I can’t speak for anyone else, but for us, this really works and we’re very happy with it. Excellent laundry Booster! I use it primarily with towels (kitchen and bath) and my husband’s work clothes. It definitely gives that extra boost! I would definitely purchase this item again. I purchased this enhancer for a friend of mine. I go to her house weekly to do my laundry. She works in home care and is always complaining about not being able to get smells out of bedding. She used this yesterday and said she really likes it. She said it took out the lingering smell usually left after she washes her clients bedding. She is very happy with this product. When I bought this “laundry enhancer” I did so in the hopes that it might help me to eliminate some strong smells from my sons laundry. Both of my very active boys are in sports & I have a horrible time getting the locker room stench from out of their clothes. It is absolutely nasty! Worse still, one of my boys has bad allergies & tends to break out in rashes from many detergents. That’s when I decided to try this product. Touted as being natural I put this product through the ultimate test: My youngests boys “forgotten” sweat encrusted cross country cloths from last week. I followed the packaging, though it’s fairly straightforward. If you want to remove smells you use hot water anyway. So did it work? Yes. Did my son break out from it? No, but I’m still not 100% sold. Here’s why; first, the container was deceptive. It was only filled halfway. What a waste. Next, I have been using hot water & baking soda for years to get nasty odors out of clothing & to me, this product was a near match to that in power & ability. While I was able to get this product at a discount in exchange for an honest review, I can’t help but think that baking soda is far cheaper. Finally, there is no “fresh” smell you get using this product. Actually, you get no smell at all. That was fine with my sons, though. I’ve used this for a few weeks now and I can say it does work on some smells. With having kids come having smelly laundry. Have you ever smelled a towel with dried milk or formula? Oh my gosh does it stink! I used the EnvoriKlenz on a few loads of questionable laundry I found throughout the house in hopes it would help get rid of the pungent odors. It did work for the most part but there were a few stubborn loads that I had to wash more than once to get the stench out. Bottom line is it got the odors out I just may have had to wash the load more than once. This laundry enhancer has definitely helped remove some scents that I wasn’t able to with my regular detergent alone. I frequently shop for clothing at the thrift or consignment shops. These items can sometimes carry a heavy scent from the previous owner or from a treatment done by the store. The enhancer has helped remove those smells quite a bit. More so on the less scented ones but I think with repeated washings the more strongly scented ones will lose their perfume. I also washed a couple loads of bath towels and they are fresher than before which I’m very happy about. My only disappointment was that I thought this product was a detergent when I ordered it. I was a bit surprised when it arrived and the container was labeled enhancer.